Leonore’s last two trips to southwest Ireland have been restricted by bad weather to the south coast, not managing to get around the southwest corner at Mizen Head and onto the west coast, so there was hope that we could do better this year with a widely predicted fair weather summer and do more exploring in the beautiful cruising grounds of west Cork and Kerry. Myself and Andy Cunningham would do the whole journey, whilst first David Hammond and then Jonathan Turnbull would do a week each with some variable overlap in the middle. 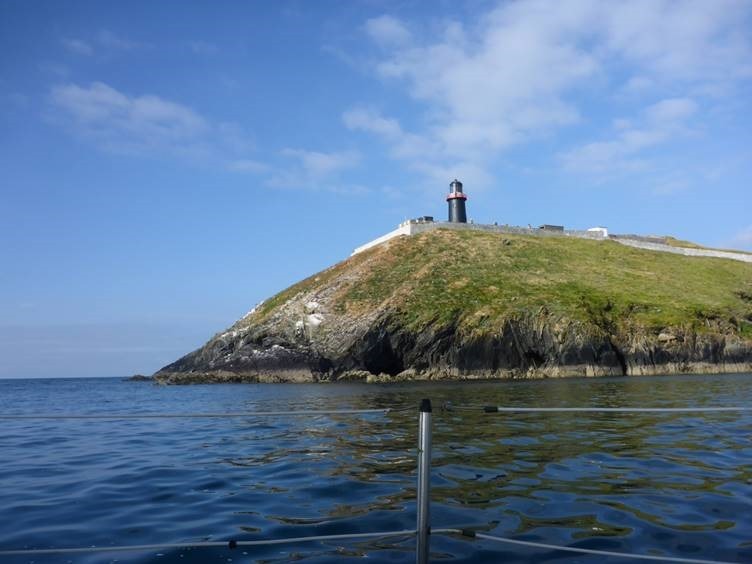 The plan was to head for a waypoint south of The Smalls and then as west as we could in the variable 3/4 wind with the general aim of Kinsale. Going was slow and we didn’t get to The Smalls till dusk and then at about 3am the wind turned west and we tacked SW then NW but then gave that up and went on motor to head west. After an hour and a half I was asleep when the motor stopped and Andy called to say he thought we were out of fuel. Can’t be, I thought and sure enough we had plenty but the motor was very hot and on inspection I discovered that it was very rough to turn over by hand and had probably partially seized (It’s a Dolphin petrol engine). 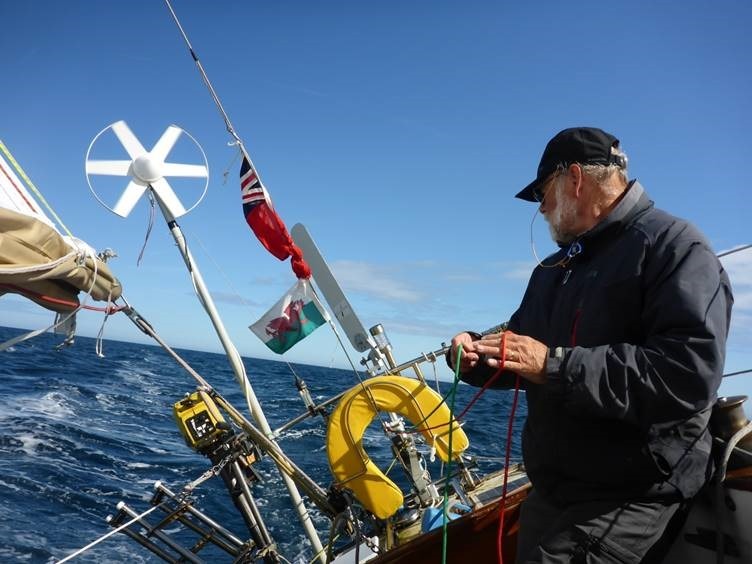 However there was also another problem – the timing of one cylinder was out which has happened before so I took a seasickness pill and dismantled the timing section while Andy continued by sail. When I was finished the engine started and ran well, but for only an hour and a half when a banging noise began, which was probably backfiring. 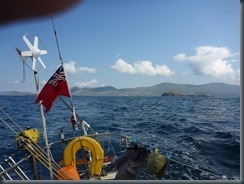 We allowed the engine to cool and so it went on, but the wind was now kinder and we made progress throughout the new day, with the Irish coast showing up around 5pm (Mine Head). We set our sights on Ballycotton for the evening landfall, eventually gained by 1050pm, whereupon we went into a rehearsed ‘cockleshell heroes’ mode the three of us each having planned tasks as we blew up the dinghy en-route, de-sailed, picked up the mooring then dashed over to the harbour and pub. 1055, Phew! The landlord was outside watching our capers and relieved us with ‘you’re alright boys’ – turned out they didn’t close till 1130! 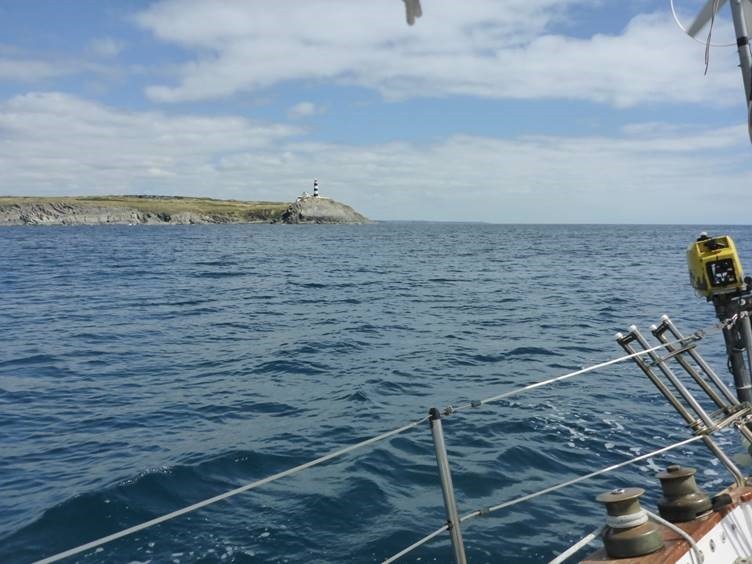 southwest wind, accompanied by warm sunny weather, arriving outside Cork harbour at lunchtime and at the Bulman Rock outside Kinsale in the late afternoon. 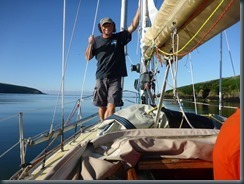 Sailing a good way down river to Kinsale we de-sailed and then motored around the visitor pontoon at Kinsale Yacht Club looking for a suitable space, but there was none, so we rafted alongside a welcoming liveaboard yacht. A couple of pints in the yacht club were followed by a trip into town to get dinner. 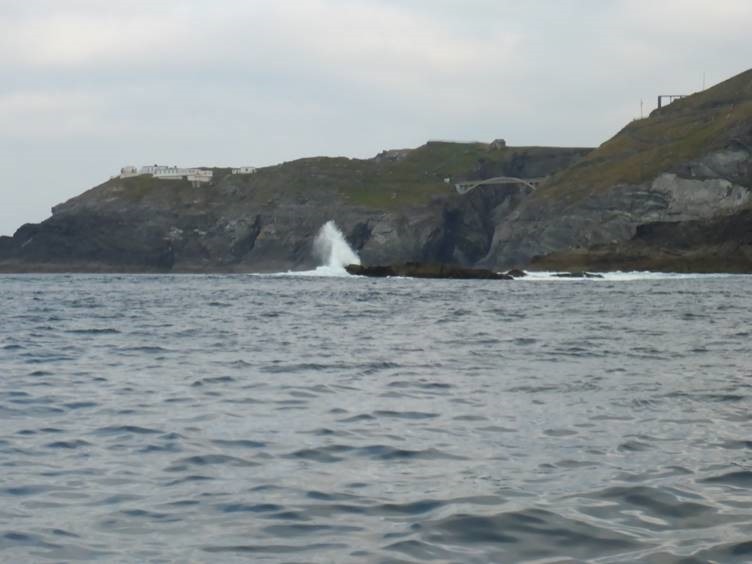 We started early as the wind forecast was poor, and headed downriver and out to the Old Head of Kinsale without being able to relinquish the engine, and so it was that the rough running and probable backfiring began again. 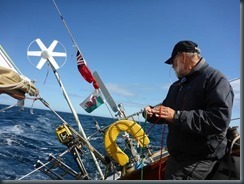 As there was no wind I determined to sort the problem which I thought to be a connected to a bearing which I had always had trouble lubricating properly due to its location. Thus as we drifted pathetically back with what wind there was we phoned all sorts of suppliers in Kinsale and Cork and eventually located bearings, grease, pullers, sealants and advice from Dolphin to at least be prepared for a bearing replacement. We even arranged for Howard back home to enter my cellar and pick up a spare unit which he only just managed to get onto Maelstrom as they sailed for Ireland! Dolphin advised me that it was a deep job, requiring most of the engine to be dismantled so I decided it would have to be held over until we were absolutely desperate if we became stranded without wind as we were able to use the engine on-and-off. Docked in Kinsale again we dispatched David to Cork where parts had been left in garages and the like as it was Saturday and some places were closed by the time he got there. I scoped the replacement job and saw that it was indeed a ‘three spanner’ undertaking with significant risk of broken bolts etc which would land us in deeper trouble. Later we heard that Maelstrom was stopping at Youghal on the way to Kinsale, so we decided that with the new bearings obtained we wouldn’t need the part they were kindly bringing (Many thanks to all concerned) and so we would move on in the morning. 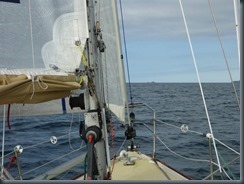 once around the head we got wind, but of course it was southwesterly, so it was down to tacking again along the coast past Seven Heads and then Galley Head. 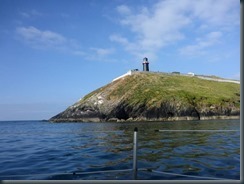 At this point the wind perked up and changed a bit northerly and we set the windvane up and headed northwest towards Adam’s Island and Glandore. Motoring up the river we picked up a rather dubious buoy, but it was ok in the light weather. Going ashore our eardrums were assailed by outlandishly loud music from a live group playing a cross between rock and trad Irish music. At the pub the decibels were unbearable and we had to find a place indoors to eat despite the wonderful weather and glorious view down to the harbour and out to the Adam and Eve islands. 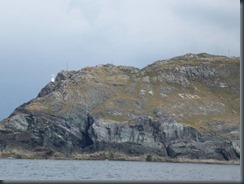 We set off at 0800, and began sailing as soon as we could, passing to the west of Adam’s Island and out past the Stack of Beans and then High Island, turning west to pass through the dramatic Stag Sound. 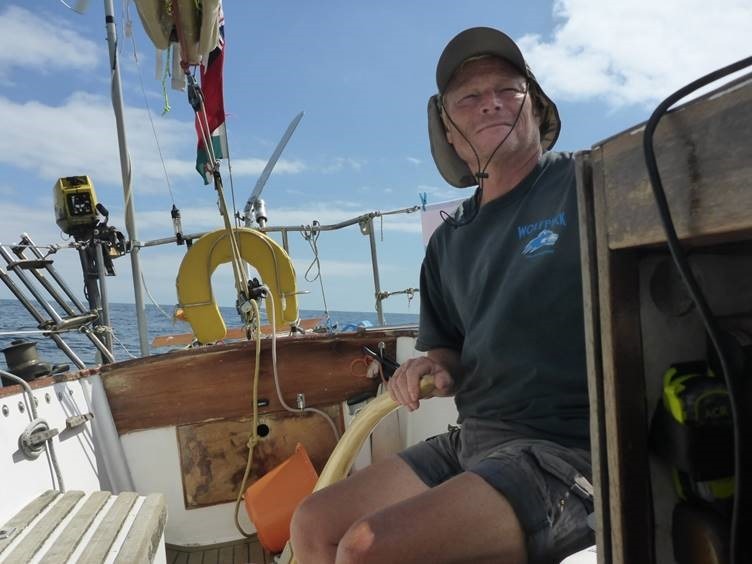 Now the wind was just a few knots and westerly plus there was tide against, so we motored half time but had to be stoical during the sailing time and just enjoy the sunshine! By 4 o’clock we picked up some wind and sailed through Gascanane Sound and into Roaring Water Bay, though not living up to its name today. 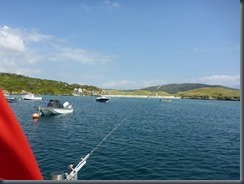 We enjoyed an unexpected pleasant beat over to Crookhaven, and then motored in to take up a mooring directly off O’Sullivan’s Bar. For the first time that I’ve been here, the sailing facility was open and we were able to have a much needed shower, followed by dinner at the Crookhaven Inn before finishing up at O’Sullivan’s. 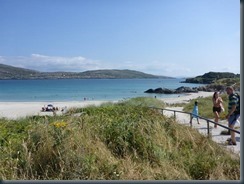 run west to Mizen Head with the tide as an added bonus. 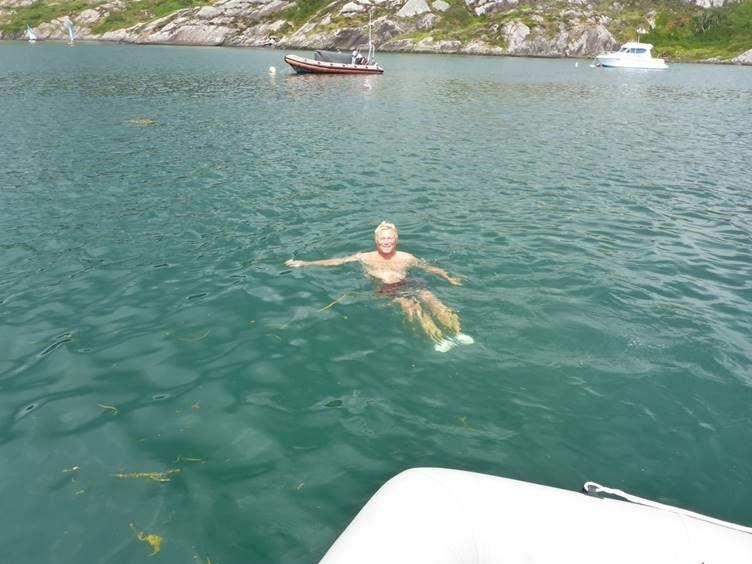 Still mindful of a previous scare we had here in 2013 it was with great respect and gratitude that I rounded the Mizen in today’s benign conditions. before we had to resort to motor to be sure of clearing the various hazards that lurk either side. 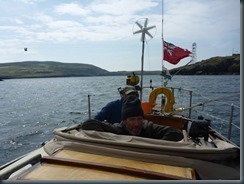 Emerging into Kenmare River (really an inlet/bay just like Bantry) we were again able to take up with the east wind and continue sailing north across the bay. 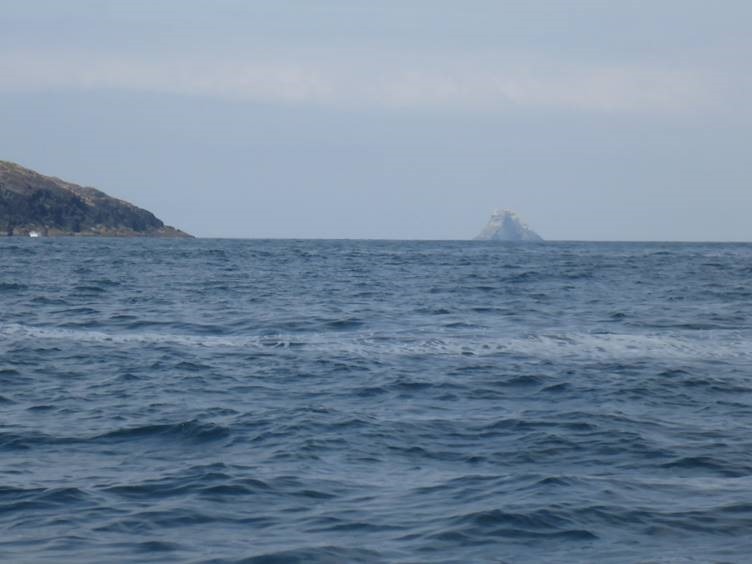 Shortly after starting this journey, we were treated to views of the stunning rock islands of Bull Rock and the Great Skellig out to sea. entertain, so it was down to me as owner! Once inside we found ourselves in an almost totally enclosed protected sea lake with a sandy shore being enjoyed by loads of holiday makers. 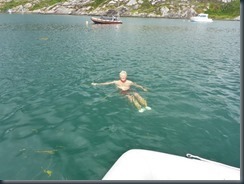 So wonderful was it that we were soon changing for a swim ourselves in the acceptably warm water. 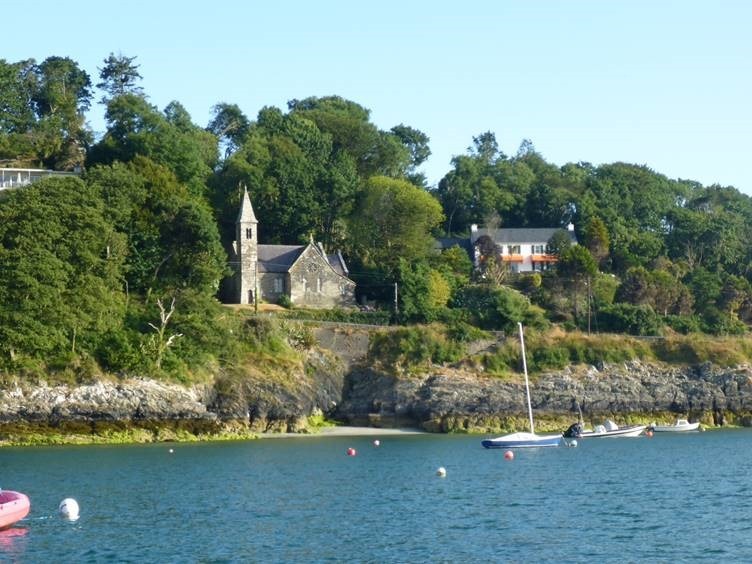 Later we went ashore and quickly found a very basic pub but as the day was yet young we walked on via Daniel O’Donnell’s ancestral home into the village about 4 miles away, which had a full-service pub for dinner. 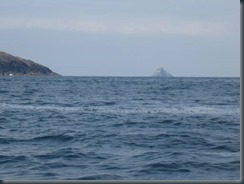 This was certainly a most satisfying and attractive turn-around point for our cruise. We woke up to another sunny day in this charming setting, but unfortunately with no wind and a rendezvous to make later on in Castletownbere. Motoring out of the dodgy entrance channel it was now low tide and we could now see all the rocks more clearly which made it easier but just as scary. 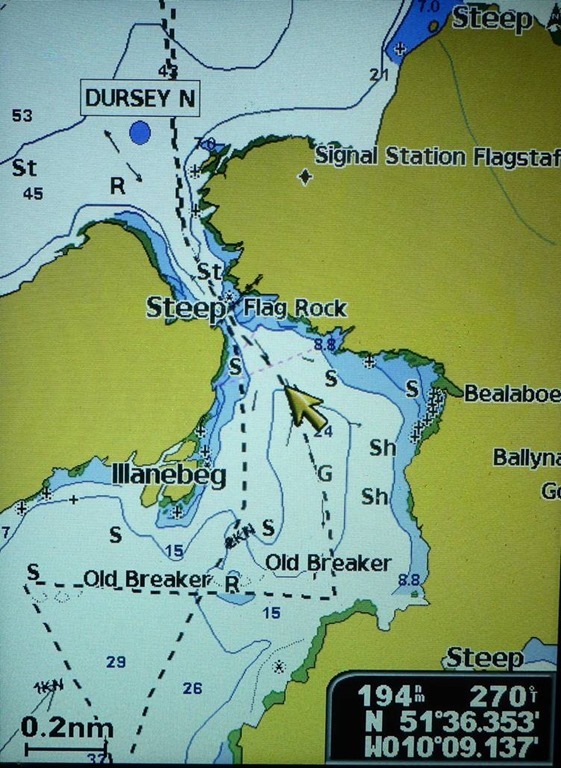 Soon we were out in the clear and in a light westerly reached down south across Kenmare River to re-enter Dursey Sound, once again using engine to ensure safety till under the cable car, after which we tacked down the wider sound and exited east-bound along the coast in Bantry Bay. 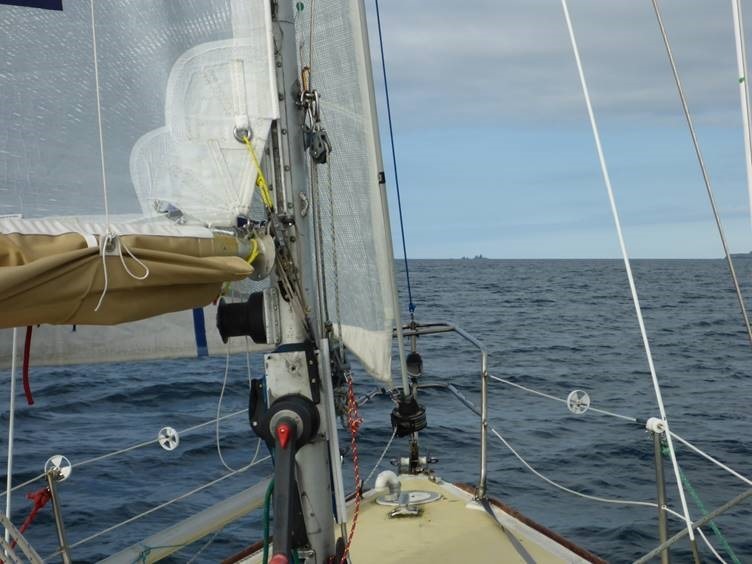 To help us along we put up the spinnaker, and found that a rip in it was perfectly placed to keep a useful view of the cliffs we were running close alongside. 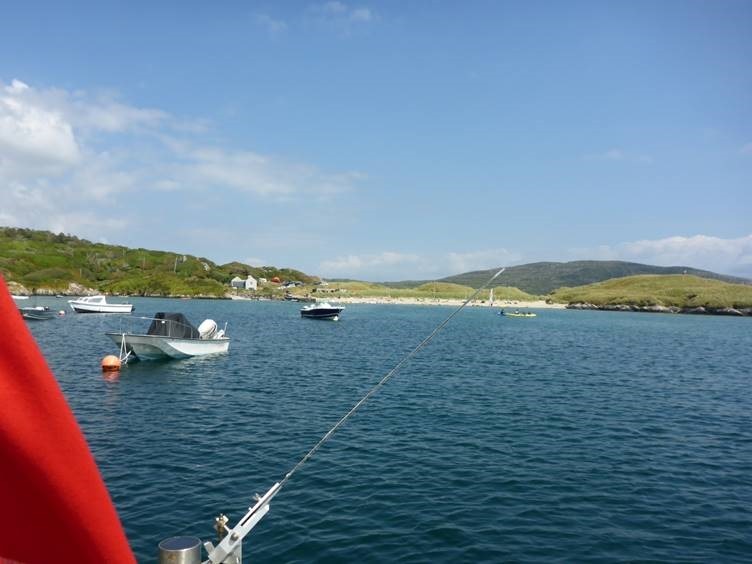 In the late afternoon we arrived at the southern end of Piper Sound which runs up to Castletownbere with Bere Island on its eastern side. 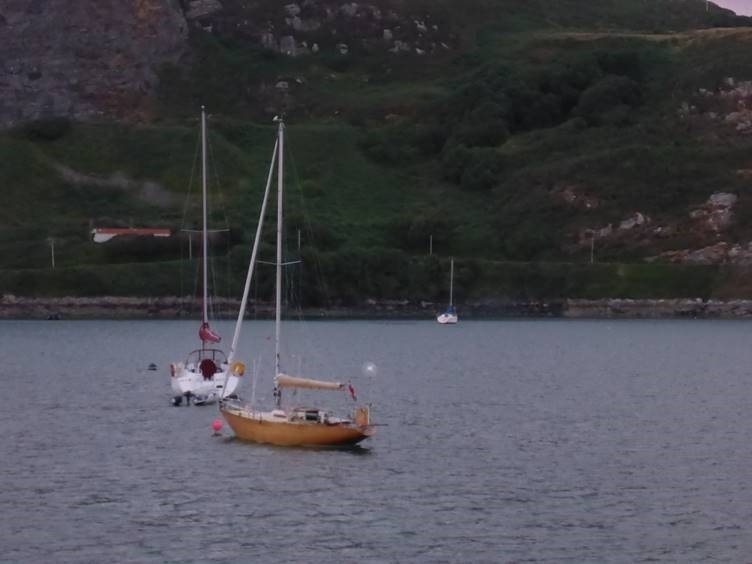 We managed to sail up to this large fishing port, and find a temporary alongside berth by the harbourmaster’s office. 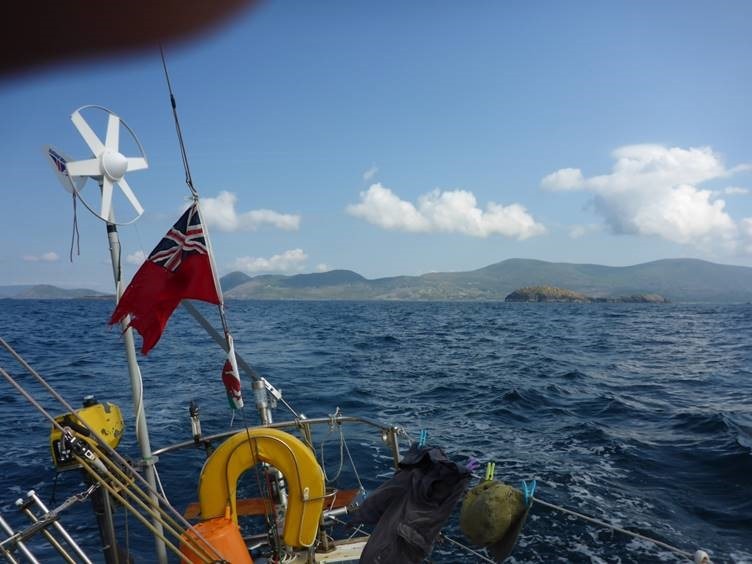 Unfortunately on approach we had a slight mishap passing a strange large aluminium catamaran with a huge anchor which snapped our fibreglass wind generator pole like a matchstick., and bent our aluminium windvane. Tying up we passed up the broken bits to Andy on the quay who sawed and bent till we were repaired or jury rigged for continued use. So now where was our new crew, Jonathan? Well almost immediately up turned a bus and out he hopped – perfect planning! Not fancying a stay on anchor in the harbour we headed out for Bere Island and the attractive marina at Lawrence Cove, which as the wind failed we ended up having to approach with a complaining motor again. The lovely setting and welcoming help from the marina owner settled us down and we got our stuff together for a walk into Rerrin, the local village, a relic of British naval operations up to 1938. Right, it was time to try and improve the engine, which had been overheating, and so we used the marina hoses to flush the engine cooling circuit back and forth, collecting quite a bit of crud from inside the passageways, forced out by the superior pressure of mains water. 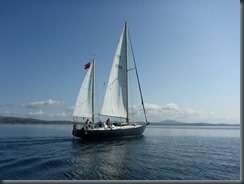 This was all made possible by the afternoon tide window for rounding the Mizen, and once done we set off sailing up to the top of Piper Sound and then down it and out into Bantry Bay. 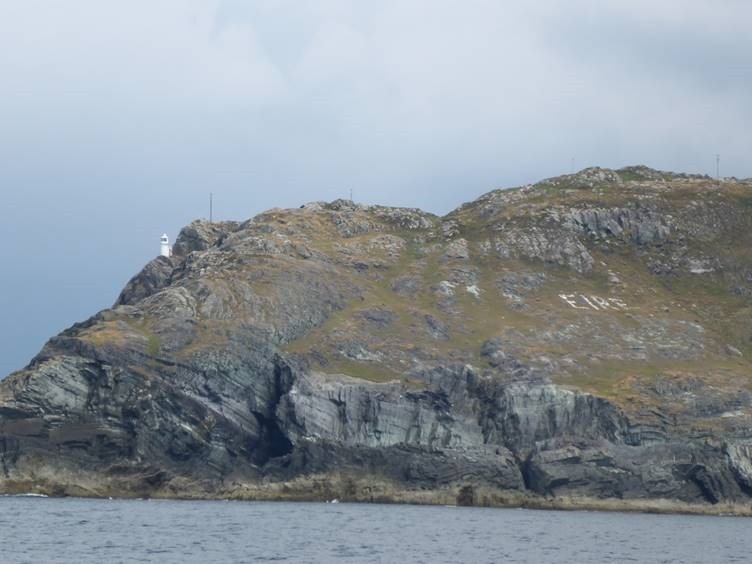 Here the wind was more or less south, but we still had time to tack down to the Mizen, coming in closer than ever before to the rock letters spelling out ‘EIRE’ on the slopes of Sheep’s Head put there after the handing back of Bantry Bay to Ireland in 1938, to warn WW2 bombers they were travelling over a neutral country. Down at Mizen Head things went smoothly and turning it we were able to reach along the south coast back to the Horse rocks and into Crookhaven again. Motoring up to find a mooring, I was happily surprised to see Sol Quest moored up and took a turn around her to make contact and agreed to meet up in the pub later. And so, after a meal in the Crookhaven Inn we met with Chris and Angela in O’Sullivan’s for cruise story swapping. Very low wind predicted today, so a limited distance, plus the need to get David off onto a bus home suggested Baltimore as the target. 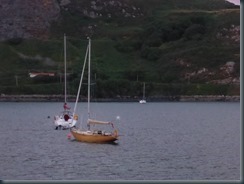 Waving to Sol Quest we motored out of Crookhaven inlet and began to drift-sail eastwards into Roaring Water Bay. 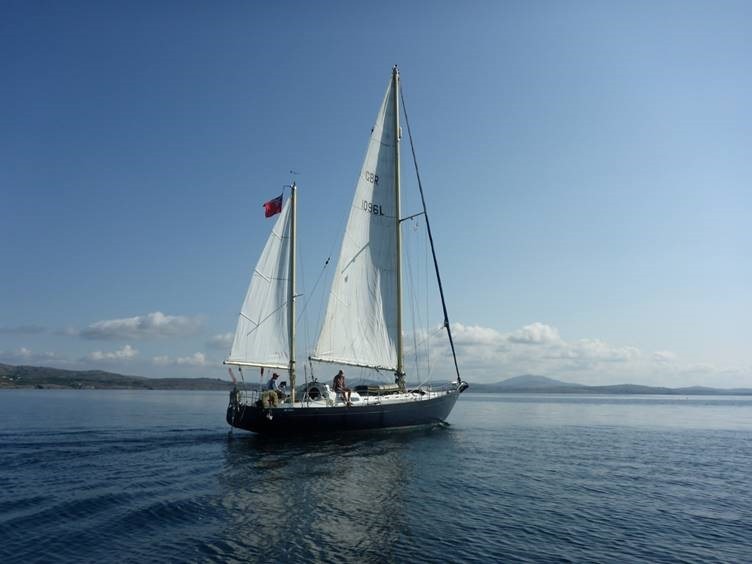 Shortly afterwards Sol Quest motored out and we photographed each other as they set sail in the opposite direction, bound for the Mizen. Going was very slow, but pleasant in the sunshine. Gradually the wind picked up and we were able to run under spinnaker past Cape Clear Island and its newly much improved North Harbour, to be sampled on a future occasion. 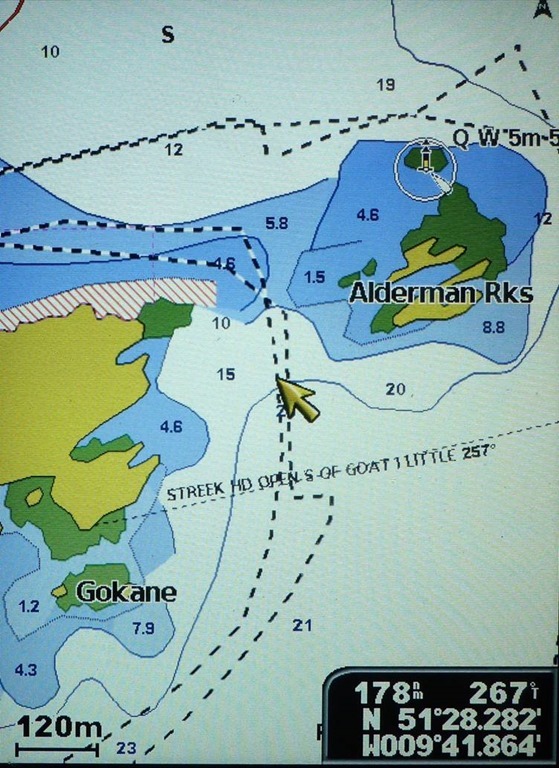 Drawing up to Gascanane Sound, we managed to sail through this fairly straightforward channel, although it has quite serious tides at times. 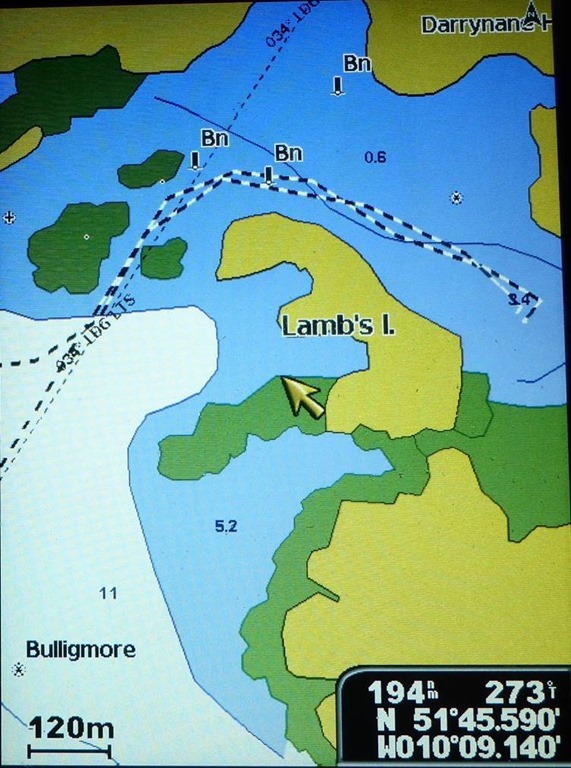 Out on the south coast again, we reached along to Baltimore, securing a place by radio with Diarmuid of the quirky Atlantic Boat Services Marina – alias an ex-Pembroke Dock WW2 concrete water bowser. We needed a bit of assistance from the ever helpful Diarmuid who nudged us into our berth with his RIB as we couldn’t quite make the required turn. We were in plenty time to relax in various ways before seeing David onto his bus to head east and then hiking along out of town to Casey’s for a great seafood dinner, followed by a return to the harbour to sample The Algerian and the favourite Bushes bar. 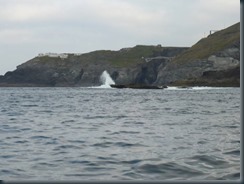 inside the Stags and on to Galley Head, passing outside the menacingly dangerous Doolic Rock, only half underwater. 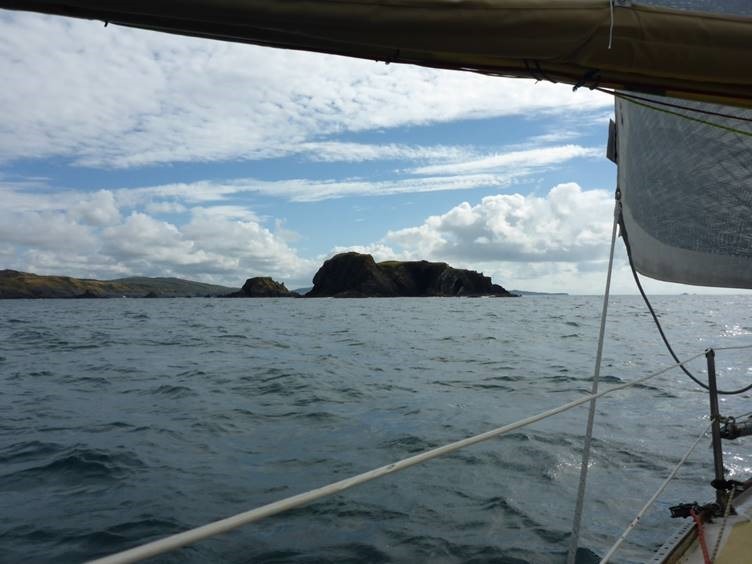 In the afternoon we crossed Klonakilty bay and rounded the Old head of Kinsale a mile or so outside, avoiding the fairly tame-looking race. 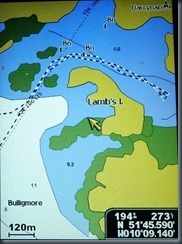 A nice reach took us quickly to the Kinsale entrance and up the river to the Yacht club for our third night this trip! Now there are myriad restaurants in town and we found it difficult to choose, however we decided this may be our only opportunity to have a curry for a while, and so entered the only Indian for miles around. This was a big mistake as it was not only expensive, but service was poor and the food left a lot to be desired – Oh well strike it off for the future, and make up for it in the pubs! This morning there was a decent wind, SW 3-4, so we were hopeful of making a trip to Dunmore, and set off down river quite early. 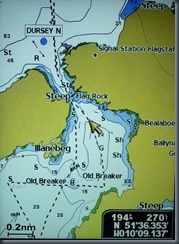 We struggled a bit to get out of the river, against wind and a full spring tide, but reaching the Bulman buoy outside we managed to bear away and broad reach along the coast, in gloomy weather where drizzle came and went periodically. This was dispiriting after so much sunny weather but we kept going, past Cork, Ballycotton, Youghal, and coming to Mine Head at the end of the afternoon we’d had enough and made our way via Helvick to Ballynacourty Point and thence up the buoyed channel to Dungarvan, pulling in at the Sailing Club pontoon. Nipping up to the club we were advised to re-moor at a point where the pontoon takes a slight corner and it would be alright to move a couple of boats out of the way. 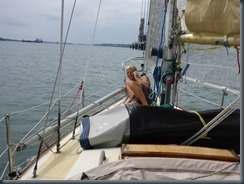 So we began to do this, and half way through a chap in a string vest fresh from sleep appeared at the companionway of one of the boats we were moving, so we thought we were in for a bollocking, but not so - he was ok with it, saying he had bilge keels and agreeing it was the best spot for a long keeler. It’s a matter of getting a place with depth, but also soft mud plus avoiding landing on the chains that secure the pontoons! On previous trips we have taken on an alarming list and it was now top springs again. Dinner was excellent at Merry’s as was the accompanying local ale. Again we had a decent SW wind and even sunshine again, so we set off at the top of the outgoing tide at 9am but chickened out of sailing straight out as local boats did (almost all bilge keelers) and opted to more or less follow the buoyed channel. 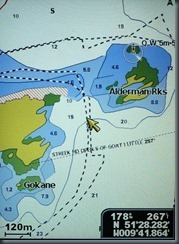 Once again at the entrance we could set sail northeast aiming for Kilmore Quay. A pleasant sail took us past Dunmore and Hook Head and over to the Saltee Islands where we turned in to Kilmore Quay harbour and moored up on the reception pontoon. After sorting ourselves with the harbour master and getting showers etc we made the standard pilgrimage to Kehoe’s for the legendary ‘trilogy of fish’, washed down with our last Irish Guinness for the time being. The forecast told of very low wind at the start of the day, so we weren’t too fussed about an early start except that the tide was east-bound, so we made a compromise and motored out at 9am, slipped through St Patrick’s bridge and began sail/drifting in the general direction of Pembroke Dock, though the wind was very slow to rise above a few knots and we had to motor in periods. 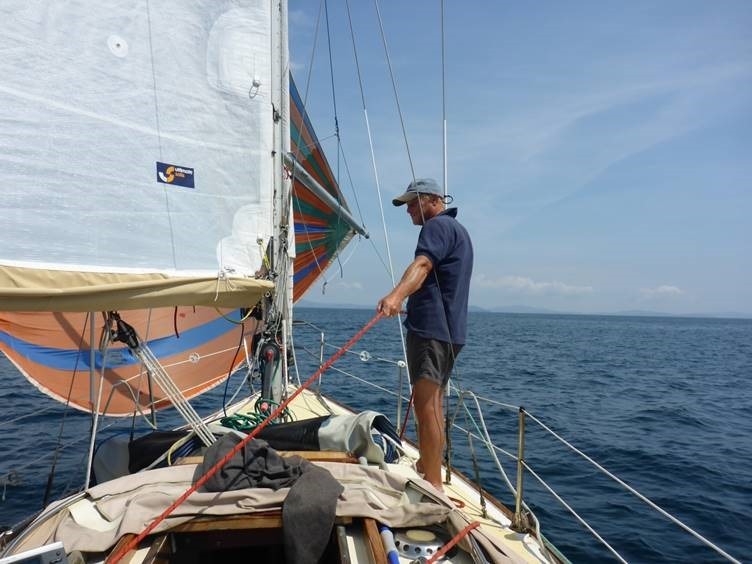 Eventually when the wind did pick up it was just east of south and so we set up the windfeather on closehauled starboard tack and settled down for the afternoon. 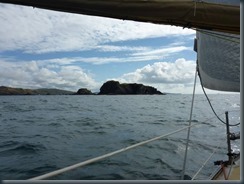 Gradually we picked up speed and in the evening we came alongside Grassholm and caught the down-going tide to Skomer, turning into Broad Sound and making for St Anns. 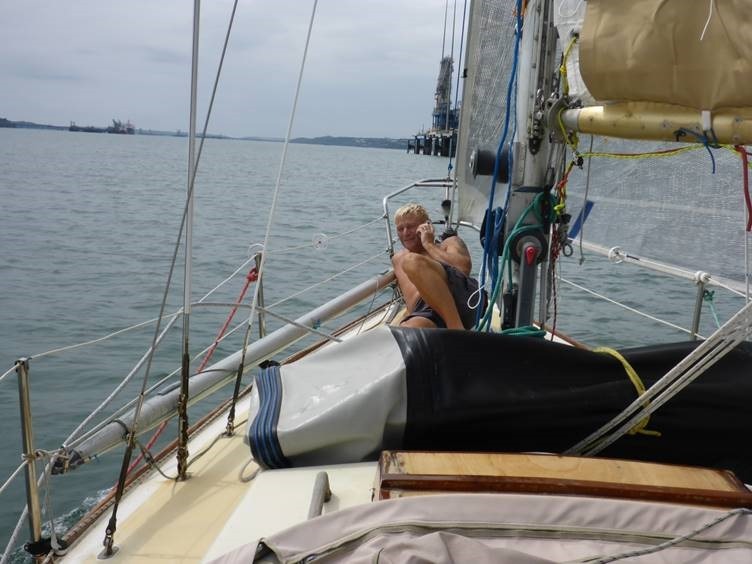 Now the tide turned and we struggled to get into the Haven and up to Hobbs Point with no wind and a protesting engine, mooring up in the dark and deciding to stay on board overnight and leave the cruise-end sorting till morning. Overall a highly successful cruise and I may become a fan of light weather, as we sailed every day and had very pleasant sunshine for all but one day. I didn’t put my boots on all trip!